Visit us at the library this summer where you can join the summer reading club, borrow books to fulfill your summer reading requirements, read for pleasure, and participate in activities/events. 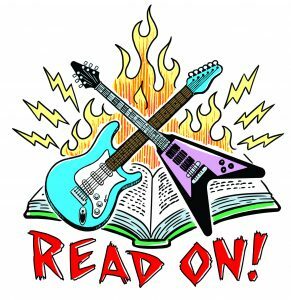 Welcome to Libraries Rock! 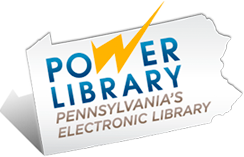 Phoenixville Public Library’s 2018 Young Adult Summer Reading Program for those in Grades 5/6-12, which begins on June 11 and continues until August 11th. You can join at any time during the program. Read books, eBooks, or listen to audio books at the Young Adult level. Complete a review for each book using paper review forms available at the Circulation Desk in the Children’s Library, and hand them in there. For each submitted “tweet-length” review (at least 140 characters or the new 280-character length if you have more to say), you will receive one free media rental coupon (for a feature DVD or a video game or an audio book) redeemable at Phoenixville Public Library and a raffle ticket for final prize drawings – just ask library staff for your raffle ticket, complete it, and submit it. You can also receive a raffle ticket for each library program you attend. (Remember to ask at the event.) Fill out the raffle ticket, submit it at the desk, and you will be entered for the prize drawings at the conclusion of the summer program. Young adults, age 17 and under, are eligible for the Pennsylvania Renaissance Faire ticket program. Complete five reviews and hand them in by Monday, July 16th, to be verified; and you will be eligible for a free ticket to visit the Renaissance Faire on August 18th or 19th, 2018 (only on one of those dates). Please let us know you are interested in the ticket program when you register and drop off your reviews. 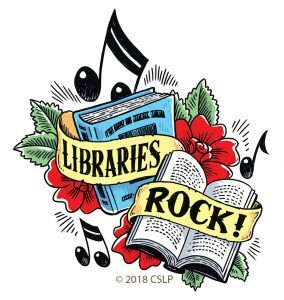 NOTE: When you register, don’t forget to pick up your Libraries Rock! water bottle and choose a young adult book from our selection that you can keep.